it’s been over a week and still no reply from boozer. and i already have that million spent. at first, i was confused about the lack of response. obviously this is a great basketball persona with mega-star making potential. pretty soon all the kids would be sporting the baby-blue boozer jersey, we’ll see an increase in slam-dunk finger tattoos as well as many finger tattoo variations, boozer will have finally distanced himself from the cult of coach k and he’ll be raking in at least 100 million dollars a year in slambidunktrous endorsements. the problem, i think, isn’t with the persona, rather it’s a problem of the persona finding boozer. (did that sound like a line from a sturges movie?) after coming up with the nickname, i searched for boozer’s mailing address and/or personal email for 36 hours straight but no luck. i had an easier time finding heath ledger’s email address after writing a surf movie for him (this was before people took him seriously as an actor). what’s the most romantic way i could ask my girl to marry me? roses? a hot-air balloon? trip to paris? we’re at war with france. just shoot her a text or something. so i need a new angle. i found a new angle watching the jazz/spurs game the other day. 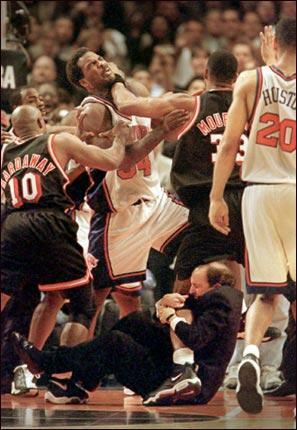 jeff van gundy used to by my favorite coach in professional sports. now he’s my favorite announcer in professional sports. as readers of this blog know, he uses fantastic analogies. then there’s the fact that he has repeatedly criticized the refs receiving numerous fines and nearly got banned from the league for whistleblowing on the nba instructing its refs to call more fouls on certain players. one time he got his head gashed open by alonzo mourning in bench-clearing brawl. and his brothers also a coach, which is pretty funny. while his basketball commentary is top notch, his jokes are even better. in saturday’s game he produced the two funniest lines from a sports commentator i’ve ever heard, and he did it in a single quarter. the first happened after fisher hit a three and breen said something about how people forget that fisher was the third leading scorer behind kobe and shaq when the lakers won all those championships. van gundy, without any delay, says “what did he average? like five points a game?” some of you might think that’s a burn on fisher, but it’s actually a burn on kobe and shaq, but more importantly, it’s a burn on breen. then later, they showed one of the twin collins watching in the crowd. van gundy chimes in, “i bet those one-on-one games [between the twin collins] in the backyard took forever.” that’s funny. 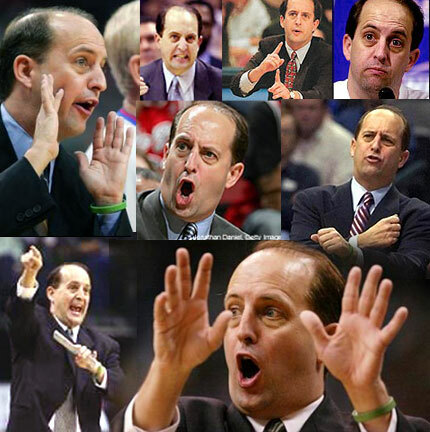 so jeff van gundy. we obviously have some sort of metaphysical connection. if there’s anybody in the nba i trust, it’s him. well, him and allen iverson. that’s why i’m going to funnel the slambidunktrous idea to boozer through van gundy. it makes perfect sense. now i just gotta find his email adress. I scratched my head about that collins twins joke for quite a while during that game. Now I’m pretty sure it’s the best joke ever told by a commentator during a game. Nice PHOTOS. Did you steal them from FreeDarko? no. i used google image search. it’s pretty great. all you do is type in what kind of picture you’re looking for and it brings up a bunch. you should try it. Thanks. Next you can show me how to send and receive emails. actually i was hoping you could show me that. i have this email i want to send in to space. i want this email to be shot into space and just float along until it eventually runs into a star or something. after i do this, is it possible for me to send and receive emails from my space-traveling emails? 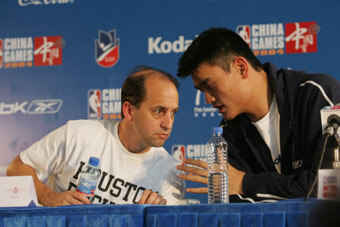 Brian, remind me to tell you about the dream I had last night involving you and the Van Gundy family. He had some good ones tonight. Like the one about the obligatory Eva shot. And the one about Tim Duncan acting surprised that a foul was called on him. i didn’t watch the game. what were the jokes? the first game he had a great joke. they we’re talking about drew gooden and he’s like, “i don’t know about that, but i do know i want his hair.” drew gooden is the guy with a square of hair in the middle of the back of his head. And there was a foul on Tim Duncan gundy said “Foul on Tim Duncan, who looks surprised as usual.” That cracked me up…even though, looking back, it wasn’t that funny. My dad told me Gooden was from Layton and I spent half the game completely believing him.